Ask fellow campers about "Collier Memorial State Park" and nearby attractions. Was disappointed in this park. The road into park with jolt you and your rig. The road thru the park was very narrow, making it difficult to back into some sites. You really have to be careful about backing into rig/vehicle on the other side of the road while backing. There was NO grass in sites! Our site was a fine silt powdered dirt! Dogs won't have grass or even pine needles to lay on. There are better choices if you are here to visit Crater Lake N.P. We camped at Collier Memorial State Park in a Travel Trailer. Beautiful little park with a delightful (mostly outdoor) logging museum, which was quite interesting. The campground is mostly wooded, and rocks & trees may provide a bit of a challenge getting into/out of some sites. 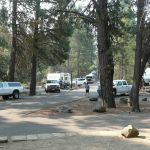 Sites are a bit closer together than in some state parks, so noise from other campers and privacy may be a bit of a concern. Several camp hosts in the relatively small campground; they were a good source of information when asked questions. Previous reviews have mentioned squirrels and vehicle hoods; if you have fabric insulation on the underside of your hood, raise it while parked there, so the squirrels can't reach it, or they will tear it off & make nests of it in your wheelwells. This information is not provided by the park, apparently, unless you ask why all the hoods are raised. Sites are paved, and many may have a slight slope to them. We camped at Collier Memorial State Park in a Travel Trailer. Smaller campground with 60+ campsites which are a mix of FHU RV sites and tent sites tucked into two loops. We reserved site B10 and, although it was long enough, we could not maneuver into the site with our 40' fifth wheel and tow dually. Several trees at the front of our site and avoiding the connections of the pull through site across from us (connections were near the road) made backing into the site impossible. The trees also had low hanging branches which would have scratched our rig. This site is better suited for smaller rigs. We were unable to get a different site as the park was full, but the park ranger tried very hard to accommodate us. In the end, we were able to get a full refund which was much appreciated! The roads and sites are paved but very narrow so take care if you are in a big rig. Also, the road entering the park is quite jarring, so go slow. Sites are very close together. Dump station on site. As others mentioned, our site had a sewer connection bent at a 90 degree angle, so not sure how that would have worked since we never hooked up. LOTS of chipmunks/ground squirrels everywhere, and most campers had the hoods raised on their vehicles (I guess to deter them from getting in there?). This appears to be a nice park, but we won't book here again as it is just too challenging for a rig our size. We camped at Collier Memorial State Park in a Fifth Wheel. Kla-mo-ya casino is less than 8 miles south of the park (and they allow dry camping there for up to 7 days). We were able to get a spot at Waterwheel RV park which was another ½ mile down 97 from the casino. Small quiet state park. Sites are mostly level with paved parking, a fire ring and picnic table. Area around site is mostly dirt, gravel and fir needles. Plenty of shade from mature fir and pine trees. Lots of chipmunks scurrying about. When we visited many quests were raising the hood on their vehicle because grey squirrels had allegedly torn up insulation around motors for nesting material. We left our hood closed and had no problem. Expect camp fires to be prohibited during summer months. Nice relaxing stay. 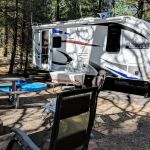 We camped at Collier Memorial State Park in a Fifth Wheel. Fishing in adjacent rivers and great logging museum nearby. Roads and sites are paved, but the road from the highway has some pretty jarring pavement joints. Otherwise the roads are smooth and wide enough. 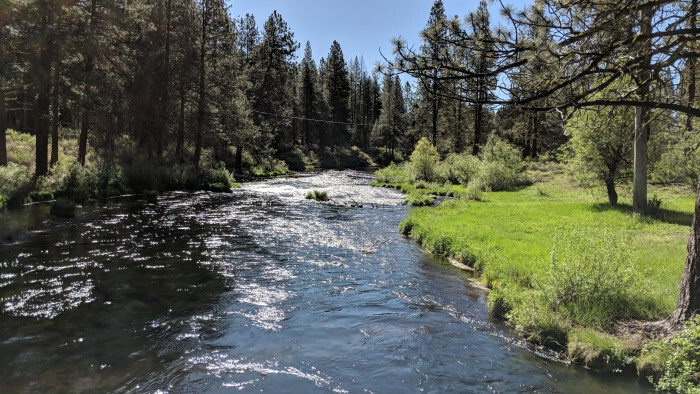 Sites are pretty level with good spacing, and all are shady & quiet with good utilities, long picnic tables and fire rings (firewood available). Restrooms are well kept. You have to drive a bit to get to shopping and it's about 45 min drive to Crater Lake, but the CG has all kinds of activities and there is a logging museum just across the highway. The park rangers are very helpful and the whole CG is well kept and run. Connectivity is poor with limited VzW and no WiFi. We camped at Collier Memorial State Park in a Fifth Wheel. Get your gas, groceries and ice in Klamath Falls or Bend before you get here. There just isn't a whole lot around that is close by. Nice state park beside a beautiful spring fed creek. Asphalt roads and pads, our had a weird connection for sewer. Some others did as well, remainder I saw were traditional screw type connections. The logging museum was interesting. Wish we were here for their big celebration on Sunday. They fire up all the old steam equipment. We camped at Collier Memorial State Park in a Motorhome. We stayed three nights beginning the Sunday of Memorial Day weekend. The campground was full when we arrived ... glad to have had a reservation. Spacing between sites is a little smaller than some of the other Oregon state parks, but noise / privacy was not a problem. We camped at Collier Memorial State Park in a Travel Trailer. Crater Lake is ~ 1 hour drive and well worth a stop. Views of the lake are spectacular especially on a calm, clear day. 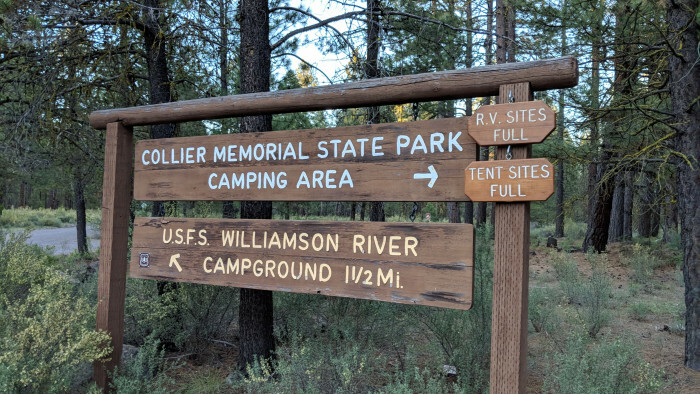 There is a nearby USFS campground Williamson River right near the entrance to Collier. It has no hookups, but much better spacing per site and is much cheaper ($10) if that is important to you. Entrance to it is on a 1.25 mile dirt road in decent condition. We stayed here and really enjoyed it. Very pretty well maintained state park. Easy access from Hwy 97. They have several nice size sites that are back in and several pull throughs, though we wouldn't fit in but a couple of those because of the curve to the drive. Everything worked well with our FHU site. We would stay here again for a few days. We camped at Collier Memorial State Park in a Fifth Wheel. A fantastic value state park, which we used as a base to visit Crater Lake. We also walked over to the logging museum which entertained the family for a couple of hours. Camp hosts were friendly and helpful. Roads were quiet and we saw many kids out on bikes and scooters. Mosquito spraying was underway and the mosquitoes were not very bothersome. Some of the sewer connections are very old, and we ended up using the dump site as our hose would not fit securely. The site was level. We camped at Collier Memorial State Park in a Motorhome. Wonderful park nestled among tall pines. Great utilities well placed. No OTA or satellite TV. Good Verizon service. Mostly level asphalt pad with huge dirt site. We choose to back to river expecting a view but the underbrush was too thick. Our site had a small path leading to the river so we had a lot of other campers crossing through our site. Huge wooded area behind campsite with both maintained trails and an area to wander around. In addition there are trails along the river and maintained trails and bridges to access the Logging Museum and day site on the opposite side. Very easy access to Highway 97. We camped at Collier Memorial State Park in a Fifth Wheel. 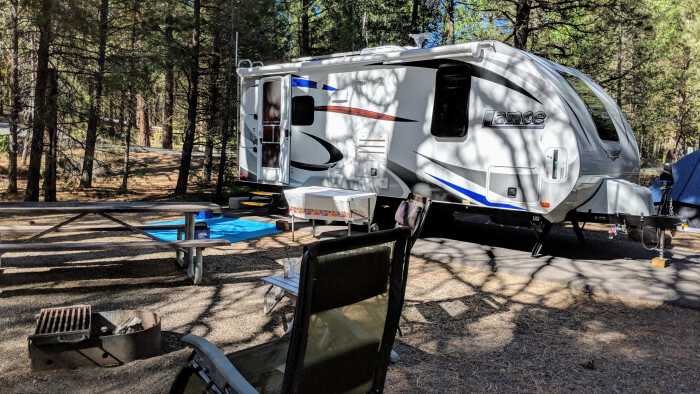 This Camp is about 30 minutes to Crater Lake National Park along a beautiful scenic route. The Logging Museum is well worth a visit and is easily reached by the walking trail. The Indian casino is about 9 miles south and has very reasonable gasoline and diesel. A Very Beautiful & Clean State Park! We camped at Collier Memorial State Park in a Travel Trailer. We went back to Chiloquin to shop, except for ice which is available en route between the campground & Crater Lake or Chiloquin. Good connectivity. Nice park. Great for a getaway or an overnight, as we did. Lots of mosquitoes. Easy to navigate around. 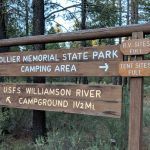 We camped at Collier Memorial State Park in a Travel Trailer. This park is kind of out of the way, there is not much to do very close by and not many stores nearby either. But it is a wonderful place to get away from busier areas. The sites are large and wooded. We have a 41 foot 5th wheel and had plenty of room at our site (B3). Our site backed up to a river and we were able to launch a kayak right from there. There was also a trail behind our site that went along the river to the Visitor Center and Logging Museum which is worth a visit. We went to the Klamath & Western Railroad for the free train rides on Saturday which our kids loved. We also visited Crater Lake from here which was about 45 minutes away. Verizon 4G was a little slow at first, but we put up our booster and then had a decent signal. AT&T was very weak and not usable most of the time. Our site had full hookups which was great. The only downside were the mosquitoes. We really enjoyed our stay and would definitely be back if we are ever in the area again. We camped at Collier Memorial State Park in a Fifth Wheel. All the sites are paved with full hookups except for the tent sites. All the rangers were very friendly as well as the host and as soon as someone left, the site was cleaned of pine cones and branches. Very treed so we did not have TV for the days we were there. Most all the sites were reserved and if one was not reserved you could stay only one night in that site. Our first time for staying at an OR state park and we were quite impressed. We did have to pay $8 for our reservation for the entire time and could have stayed for five nights under the OR disabled veteran pass so it was a great deal. Usual nightly fee is $26. Mosquitoes were bad but they were scheduled to spray for them the day we left. We camped at Collier Memorial State Park in a Motorhome. The Collier Museum is within walking distance and is worth visiting. Nice state park with full hookups. A little tight for a big rig but doable. Lots of shade and quiet. No ATT service. Too many trees for satellite to work. We would come again if in the area. We camped at Collier Memorial State Park in a Fifth Wheel. Close to Crater Lake. Nice loggers museum near park. If you fish, the river looks nice. The logging museum was very interesting. 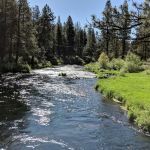 Hike, bird, trail bike, picnic, star gaze, swim, wade, tube, kayak fish Spring Creek or Williams River. Crater Lake, Upper Klammath Lake, Klammath Falls, Fort Klammath, Sprague River nearby. Roadhouse restaurant nearby. Thank you Oregon. Out. Crater Lake is quite spectacular, but the road work there is a pain. Go the other way around and don't waste your time waiting for the road to open for traffic your way. The Train Mountain Railroad museum...a little heard to find but worth looking for. 32 miles of track...amazing. And we got a free train ride around the grounds. The bookstore in Chiloquin...they claim to have a half million books, very funky, very interesting. ElRodeo Mexican restaurant about 7 miles south, recommended to us by the Ranger. We had a great breakfast there. The outdoor Logging Museum is a must and worth a stop on it's own. Probably the best option for visiting S. Central Oregon. Obviously, visit Crater lake! The logging museum is pretty cool, and if you have a 4wd vehicle, the USFS area next to the park has miles of (very dusty) roads to explore. Very sad seeing all the garbage dumped in the area though. Close to Crater Lake for a day trip. DO NOT MISS going to the Logging Museum across the road! Fantastic place and also includes a village of old cabins and their meanings and background. Also, you are about 45 minutes from Crater Lake. Fuel / propane can be obtained 8 miles south on Hwy 97. The logging museum accessible by a cute trail from the park with a pedestrian bridge across the Williamson River is a Don't Miss! It's like all of the equipment was just abandoned but somewhat maintained. Definitely not an indoor museum. Interesting login museum and river trails right in the park area - no need to get in a car and drive. Not a bad drive to Crater Lake NP, Klamath Falls and other areas. Don't miss the Logging Museum across the street. Easy drive to Crater Lake. Try Rapid Pleasures river rafting- good deal- good fun. There is a river to play in (lots of people floating on inner-tubes) and huge logging museum within walking distance of the RV park. Logging museum 1/4 mile. Crater Lake easy drive. The Logging Museum is fascinating for young and old and FREE! Are you affiliated with Collier Memorial State Park ?